One of the web sites that I helped Captain Outrageous to set up is called Key West People. It consists of almost three hundred photographs that he chose from a library of many more than that and is made up of photos of people he knew over the years. Many of the pictures are from his days as proprietor of the Last Straw Restaurant on White Street that he operated for a few years sometime during the early '90s and, as it turns out, was the main thing that launched his career as an artist. When I have some time, I hope to pay tribute to those unnamed souls on Key West People by adding their names and maybe their stories to their photos. If you peruse the pictures and recognize someone you can name, I'd appreciate hearing about it from you. E-mail me with what you know about the person(s) in the photo(s). I'd like to be able to talk to some of them if they're still around. 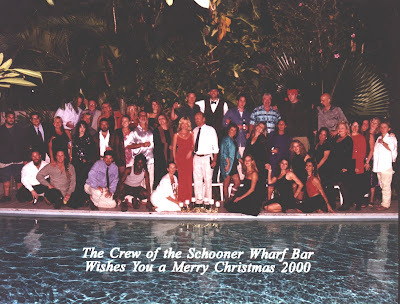 Meanwhile, to kick things off, here's a picture of the entire Schooner Wharf Bar crew at their 2000 Christmas party. Eight years on, I can still name some of the people and some of them are still there. There's Mary Anne, Frank, Leigh, Jan, Vickie, Bob. I see Jamie, but she left in 2002 or 2003. Of course, Paul & Evalina there in the front. Who do you know? Leave a comment with names you know. Click on the picture to see it at full size.